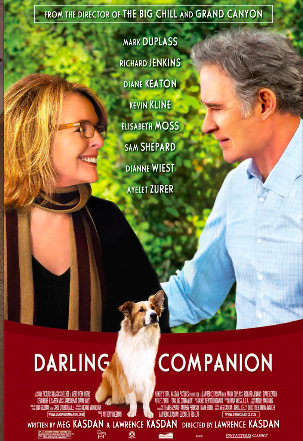 A brilliant ensemble of actors are featured in Lawrence Kasdan’s new film Darling Companion including Oscar winners Diane Keaton, Dianne Wiest, and Kevin Kline as well as terrific newcomers like Elisabeth Moss and Mark Duplass. The film follows the story of Freeway, a abandoned dog which is adopted by Beth Winters (Keaton) and her family at a moment of crisis and illuminates the fractures in the family which is underscored when her husband Joseph (Kline) loses the dog while distracted by a work call. An epic quest to find the dog ensues led by the housekeeper, Carmen (Ayelet Zurer), who is also a gypsy animal psychic and like the Wizard of Oz, the search changes all those who embark on it. The film walks the line of being sappy at times but thanks to wonderful comedic moments and gorgeous Colorado vistas it finds a balance. Underneath the surface, the story is really about how we maintain a harmony in our closest relationships and what happens when we don’t. Like all of Kasdan’s signature films, the characters are both real, relatable, and abundant and the supporting cast adds a great dimension to the story, especially Dianne Wiest and Richard Jenkins as Joseph’s new age sister and her unemployed, blue collar boyfriend and Sam Shepard as the small town Sheriff being driven out of his job by a younger man. Age and occupation also play a significant role in the film as the characters wrestle with the empty nest and facing the difficulties of the retirement age.